And now I get to combine the two at the Wine and Chocolate 5K in San Marco. 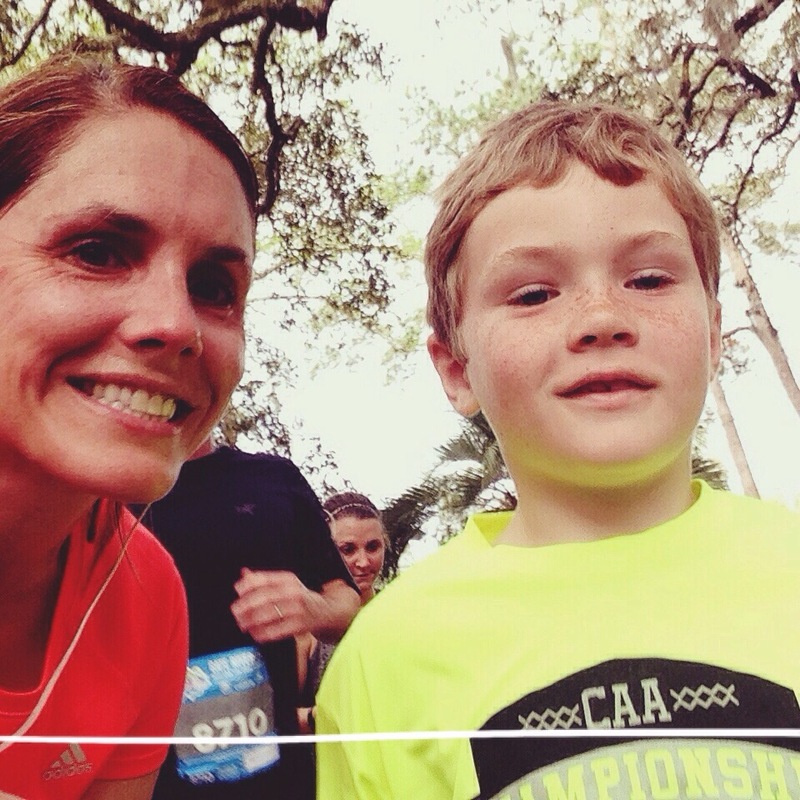 Join 1st Place Sports and Tropical Smoothie Cafe on Saturday April 22nd at 4:30pm in San Marco Square for the Wine and Chocolate 5K. This will be my very first Wine and Chocolate Run and you can’t beat getting a souvenir wine glass and wine and chocolate post race. I am very excited! It is rare that there is an event that time of day, it should be beautiful and it takes you through the beautiful San Marco Neighborhoods. I haven’t run since the Gate River Run so I am excited for a much shorter run. Check out their Facebook event page for more info. This blog is sponsored by 1st Place Sports and Tropical Smoothie Cafe. You should try an Acai Berry Boost TM with Acai, pomegranate, banana, blueberries & strawberries. Hi Friends- There is another super fun race coming up the Run 13.1 and 5K put on by 1st Place Sports and sponsored by Tropical Smoothie Cafe– what a team! I am still recovering from the Gate River Run which was a perfect race this year. Great temperature, no rain and everyone was in high spirits. I saw the craziest food on the course this year. In addition to the hot dogs, donuts and fruit I saw people passing out jello shots, rice crispy treats, full bottles of beer and so much more it was a hoot. I was so happy that I was able to be seeded so I didn’t have to get passed by too many people however, during the crowded areas I did get elbowed a few times by runners passing by. One of the greatest challenges of running is planning what are you going to eat on race day. I am great at the carb loading but I am always nervous about what I eat and drink on race morning. I try to make sure I eat enough calories to get me through the run and that I pre-hydrate without having to run with a full bladder. I usually eat gluten-free bread with some Trader Joes Better’ N Peanut Butter and a banana. During the week when I am training but not racing I love a good smoothie for breakfast. I could have a banana, strawberry, spinach, PB2 and coconut water smoothie every day practically. Why PB2 in my smoothie vs Trader Joe’s Better’N Peanut Butter you ask? PB2 is a powder and much easier to add to a smoothie than taking out a spoon and trying to scoop into liquid. Chia Banana Boost with Strawberries (Coconut, almonds, dates, cinnamon, whole grain oats, chia seeds & roasted banana with strawberry). Chia Banana Boost with Peanut Butter (Coconut, almonds, dates, cinnamon, whole grain oats, chia seeds & roasted banana with peanut butter). Acai Berry Boost TM (Acai, pomegranate, banana, blueberries & strawberries). All participants receive moisture wicking, technical shirt and a sling pack goodie bag! I ran my first Gate River Run put on by First Place Sports 12 years ago; and ever since then I vowed to run it every year. 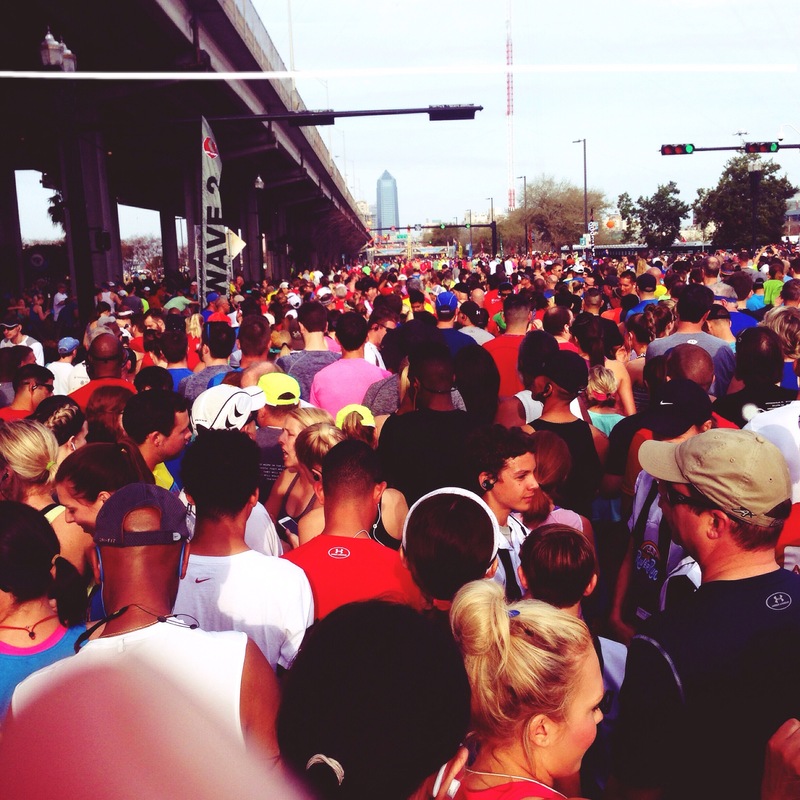 There is just something about getting up early, the rush of a crowd of thousands of people running together. You feel a part of something. I have never had the feeling quite like the feeling I have running the Gate River Run. I love running and people watching. Along the route you see people drinking Mimosa’s, drinking beer, handing out hot dogs, handing out orange slices and my all-time favorite people handing out popsicles around mile six. It feels as though the entire community is coming together. The spectators and the runners are all one even though we’re not talking to each other. While I don’t run as fast as I did when I was 28; each year I think this is the year that I’m going to beat my 28-year-old self. I’m not running against the person to my left or the person to my right I am running to beat my previous scores and be my best self. One of the greatest things about each race is there are people that come out every year to watch me run. My parents, sometimes my nephews, my brother but always my husband (just his excuse to blast music, make funny signs and crack open a beer before noon)! My nephew Ryan even joined me for about 100 yards one year it is one of my favorite memories. I love the carbo loading on Friday and the awesome expo where you pick up your packet. But nothing compares to the feeling I get when I crank up my radio as I drive over the Matthews Bridge on my way to the race. Each year I play a fun, loud song that really fires me up. 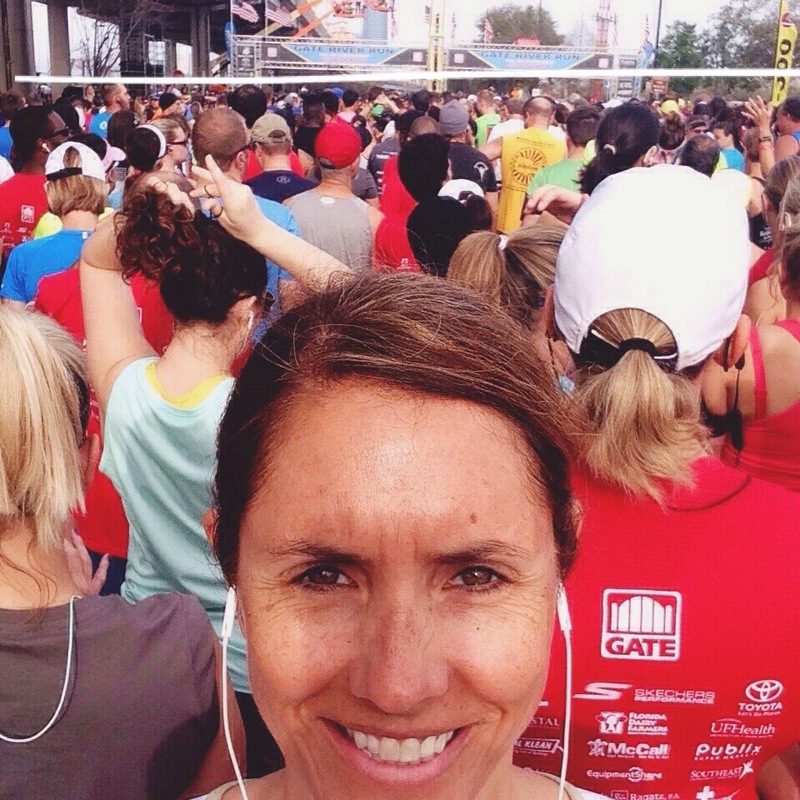 On March 11 I will run my 12th Gate River Run with over 20,000 of my close running friends. I can’t wait! 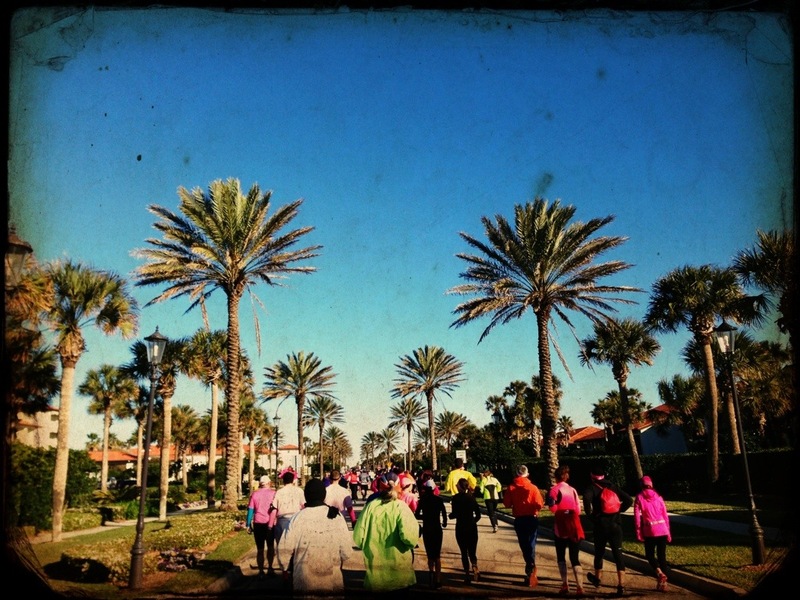 Gate River Run put on by 1st Place Sports: Saturday, March 11, 15k and Florida Times Union 5k for Charity. For more information on the 1st Place Sports Gate River Run click here. 2. Smoothies like the Jetty Punch from Tropical Smoothie Cafe. Special Gluten-Filled note: If you eat gluten and love flatbreads try out the Cha Cha Sriracha Flatbread at Tropical Smoothie Cafe. It is made with grilled chicken, mozzarella, shredded carrots, house-made roasted pineapple salsa, cilantro, scallions & caramelized pineapple Sriracha sauce on a toasted flatbread. What I listen to: I love it- Icona Pop, Safe and Sound- Capital Cities, Fancy- Iggy Azalea, Sugar – Maroon 5. 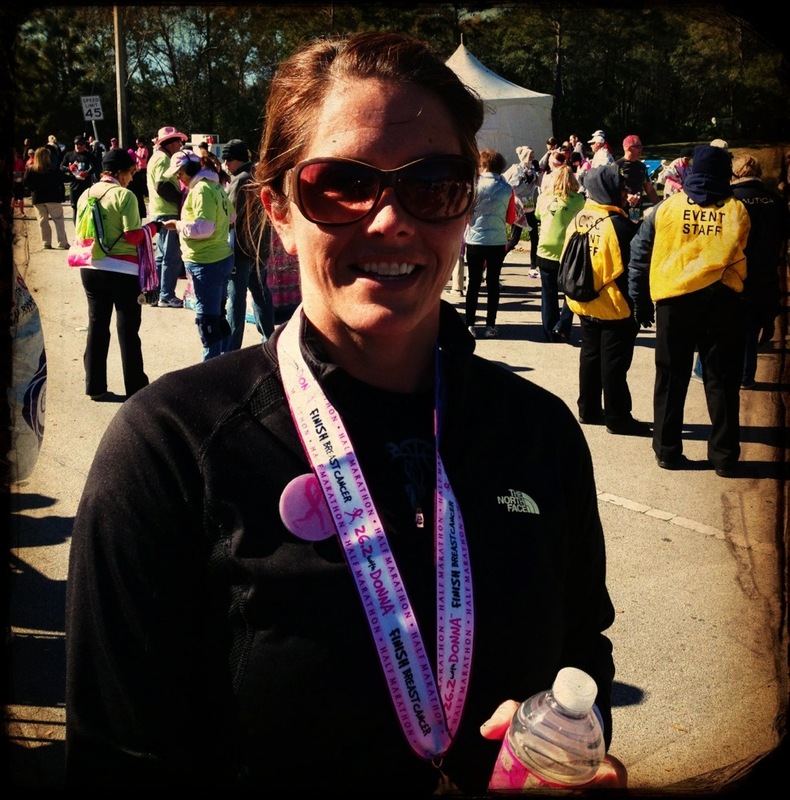 Last month I ran the Donna Breast Cancer Half Marathon. 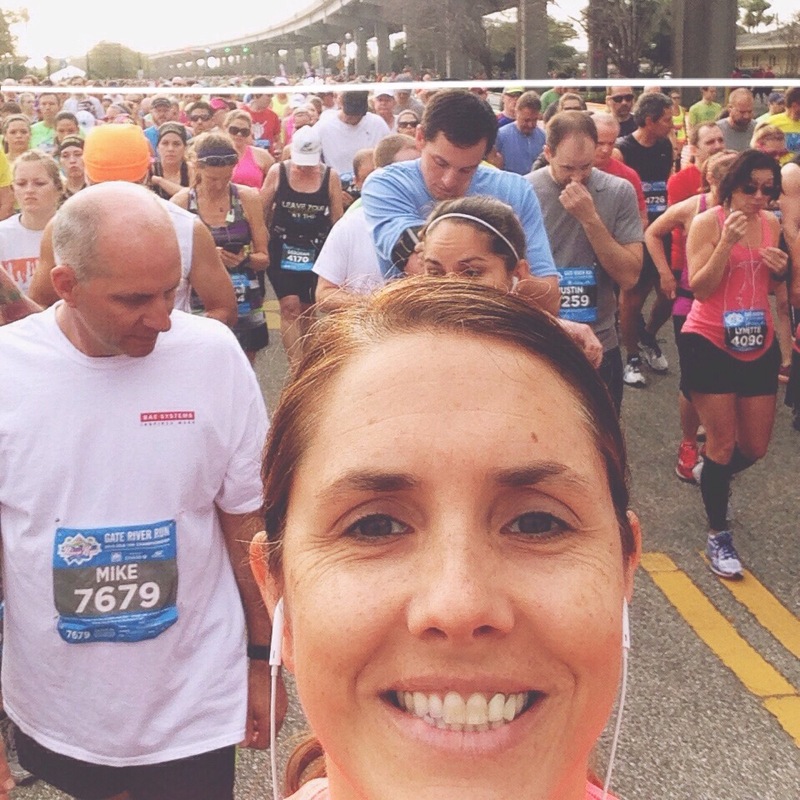 I have run half marathons before, however, I had not run one since I was diagnosed with Celiac Disease. I started noticing a difference in my energy levels about 1 year before my diagnosis while running. I would just feel so tired during and after running. Now that I have my Celiac disease under control (some-what) I have started running again and it feels great. Whenever I am feeling sluggish or moody from being glutenated, a run almost always helps me feel better. I felt amazing after the Donna. Ok, I felt sore on Monday and Tuesday afterwards but nothing out of the ordinary. I really tried hard to prep correctly the week of. I took some steps prior to the race that helped me so I thought I would share with the hopes that you will share some with me! Find a training program that fits you. I cannot run more than 3 times a week. I am 5 feet 11 and my body just can’t take running two days in a row. There are a ton of resources online to help you come up with a training program. I like programs that include a little speed work one day and cross training on other days. I like to do Yoga once a week while I am training for a long race, it helps strengthen and stretch muscles that get overused during long runs. Hydrate with water and sports drinks 2-4 days before the race. Day of: Get up no less than 3 hours before race time; drink 16 ounces of water right when you wake up; eat foods you are familiar with (I like a banana and peanut butter toast). I think the goal is around 300 calories 2 hours before race time. Try to eat and drink with plenty of time to use the restroom (#1 and #2) before you leave and leave with plenty of time to get to the race – traffic is almost always an issue arriving at races. During the run: Have fun- talk to people cheering; give high fives to spectators; take pictures of your surroundings; take water breaks at every single water station to help you stay hydrated and give yourself a little break; listen to your body and walk if you want to; set a goal for you not someone else; and start slow- real slow. Don’t forget: Congratulate yourself! You did it! Smile! There is no better feeling than finishing a race you trained months for. No one can take away the fact you set a goal and achieved it. This weekend I am running the Gate River Run. Are you? Do you do any of these things to prepare? What are some of your tricks and tips? Congratulations to Lindsay for winning the Tuttorosso Giveaway! I am a member of the Brooks Family YMCA, yet somehow I don’t feel like the classes at the YMCA are as strenuous as the classes taken at facilities that specialize in specific workouts. Exercise has always been important to me, but since being diagnosed with Celiac disease I have experienced huge mood swings and lethargy so motivation to exercise has been tough. (See Mayo’s 7 benefits of exercise). I needed a workout that could provide some variety, excite me and motivate me to put on my gym shoes (or yoga pants) on a regular basis. Which is why the Groupon/Living Social Workout of 2011 worked for me! The Deal: 20 days of hot yoga for $20. Radiance of San Marco is one of the newest Bikram Yoga Studios on the scene. Bikram Yoga is “hot yoga.” Each class is 90 minutes and you flow through the same set of poses each class. It is led by an instructor who tells you everything you need to be doing so that you don’t need to look around the room to see how you should look in the pose. Time flies by because you are constantly listening to the sound of the instructors voice to inspire you to go deeper into each pose. Bikram Yoga works every single muscle and tendon in your body, however, it is not for everyone. The room is close to 100 degrees and there are times you may feel light headed or dizzy. I did Bikram during my training for the Gate River Run and while I usually have some sort of knee injury, I was able to avoid any injury. My only criticisms of the practice is that there is not a whole lot of upper body strengthening and there is no music, not even during savasana (my favorite pose, haha). There is no vinyasa, downdog or updog or plank positioning which usually are used in yoga for arm and core strength. However, there are a lot of other core strengthening exercises as well as lower body strengthening exercises in this work out. Probably the best core workout of any of the exercises in the Living Social/Groupon workout plan. The Deal: One month of unlimited personal training sessions for $23. Timed Exercise is scheduled in 30 minute blocks of time. Each day has its own workout that mixes up reps and sets so that there is never a duplicate workout throughout the month. The object is to complete the workout as fast as you can and try to finish before the 30 minutes are up. You are assigned your own pod to complete your workout in and all of the equipment is right there for you, except for pull up bars that are shared throughout the class. They play awesome music really loud to motivate you and there are 2 instructors who constantly walk throughout the room to scream your name, correct your form or help you out if those last two reps are difficult to complete. The instructors get to know each and every person and they remember your name every time you attend (this impressed me most). Each workout includes some type of push up, some type of sit up, some type of pull up, some type of row and some type of full body exercise. I have never been so sore in all my life as when I did Timed Exercise. While I loved the intensity this is not the work out for me. I liked how quickly the exercises could be completed, but I need a workout with more of a warm up and cool down. I have a lot of friends who have lost a ton of weight and have great biceps from these classes. I will say, my upper body strength was the best it has ever been after these workouts. The Deal: $15 for one month unlimited. I have been to this yoga studio before. It is located in San Marco between Emerson and University Blvd on Hendricks Avenue in a nice space with an outdoor courtyard. It is an older studio by a busy and sometimes loud road. The instructors are very informative and there are all levels of yoga practitioners in the room. This practice incorporates the yoga flow with down dog and up dog in a soothing relaxing atmosphere. Yogi’s in this practice are quiet before and after each class and the smell of insense fills the studio. The room is not too warm and they rely alot on various props from blocks to straps to bolsters. Classes are one hour and any fitness level can attend. The Deal: 35 days of yoga for $35. MBody has been winning awards from various publications as the best Yoga studio around. This was the first time I had ever tried it. This deal was good at their Southside and Neptune Beach locations and not good at their San Marco studio. This is a very popular practice. Unlike Bikram and Power Yoga of San Marco this is a very active and social and engaged practice. Everyone is talking, the instructors are loud, you are forced to have your mat relatively close to your neighbor. At my first class we were encouraged to use our neighbor to help us with certain poses. The instructors are very loud. At first it was distracting, now I have realized that they get loud right about the time I feel I can no longer hold a difficult pose. This helps me push through. The room is heated but it is not as hot as Bikram. The Deal: 5 hot yoga classes for $25. Bikram Yoga Jacksonville is located in Neptune Beach close to the intracoastal just off of Atlantic Boulevard. This is the hottest of all the yoga studios. It is run by Rob who actually used to be one of my Junior Volleyball coaches in high school. His friendliness creates a nice environment in this studio. If this studio was closer to where I lived I would become a regular. It has such a great beach feel to it. There was usually plenty of space in the studio to practice. After each class, when I was drenched in sweat I looked forward to the outdoor showers located behind the studio. It was such a nice reward. On one particularly hot day during the summer, Rob bought watermelon for everyone. The Deal: One month of unlimited dance classes for $29. I have known about Dance Trance for some time. Many of my girlfriends have told me how fun it is. So I was excited to try out this deal because I love to dance. I was not prepared for my first class at all. I knew none of the dance moves, the music was fast paced and loud, but I had a blast. There is some repitition to each of the dances so I picked them up pretty quickly. I was not the only person there who didn’t know the routines so I just hung out in the back of the class with the rest of the relatively new crew. If I got completely lost I just shook my hips and waved my hands in the air. They have a class called breakdown where they teach the new songs for the week. I loved the music. Almost all of the songs were current popular songs and were about feeling strong, getting over that guy, feeling good about yourself, etc. It was such a great workout, I forgot I was exercising a few times and found my self smiling ear to ear the entire time. Prior to beginning each of the deals, I would call the facility to tell them I am a new student and ask if I need to do anything or come on a specific day. The only deal that had a specific start date for new students was Timed Exercise. Not really sure why because you have to sign up online to schedule your “pod” and pretty much every day I was there there was someone else who was new. Where is your favorite place to workout? and why?